A vertical water smoker can be quite a puzzle, especially if you are approaching one without instructions. 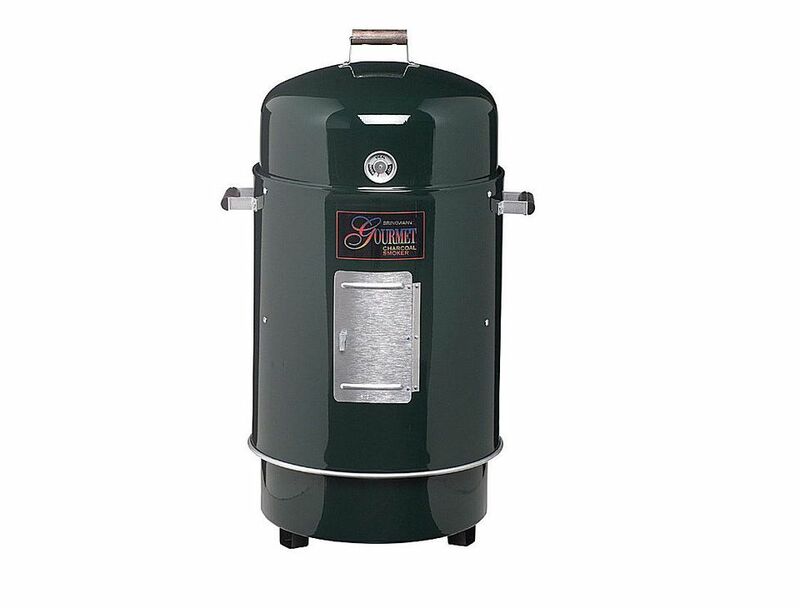 Start small and work your way up as you gain experience and get to know your smoker. Use these basics to understand how it should operate. First take the smoker completely apart and set the base (it is short, round, and has feet) where you want to set up for smoking. Place the metal charcoal pan inside the base and fill with about six to 10 pounds of charcoal. The more charcoal you use the longer the heat will last. Light the charcoal and let it burn uncovered until the coals are almost entirely white and the fire is producing a lot of heat. While the coals are getting ready, heat enough water to fill the water pan about three-quarters full. You want the water to be hot so that the burning coals don't have to heat the water for you. Place the water pan in the barrel (the tall part of the smoker) on the bottom hooks and fill with the hot water. Now place the barrel, carefully, on the charcoal pan section. Replace the wire racks in the barrel section, one on top of the water pan and the other on the top hooks. Now you are all set to smoke something. You can use the door to access the fire and add wood chunks to create smoke. One of the problems of these smokers is that the bottom rack (half of the cooking area) is not good for smoking. The smoke is only held in the lid section so only the top portion of the smoker works effectively. In general, it's big enough to smoke a whole brisket, though. Once you have the food on the top rack of the smoker, replace the lid and let it go. Use an oven thermometer to read the temperature. Place it inside the smoker near the food. Check it occasionally. Remember that every time you lift the lid you let out the smoke and a lot of the heat, so leave it alone as much as you can. After about two to three hours the coals in the coals pan will become caked with ashes and the airflow can simply stop. This then causes the temperature to drop and stops the smoking process. Several people have tried to come up with modifications to the smoker design to eliminate this problem, but so far there isn't an effective solution. You need to get the ash out of the pan to return to a good smoking environment. Clearing the ash can be tricky and is more than a little dangerous. Wear eye protection as the fine ash is very irritating to the eyes. The hot coals are murderous. Wear thick grill gloves and be sure you are wearing long pants rather than shorts. Make sure that if you elect to do this trick that you do it away from anything flammable and that you have quick and easy access to water. To clear the ashes from the pan, remove the barrel section of the smoker to expose the coal pan. Start by standing upwind of the coal pan and with some very thick grill gloves to lift the coal pan out of the base. These pans are generally aluminum and don't get too hot, but you still need to be very careful. By carefully shaking the pan back and forth most of the ash will fall through the vent slits in the bottom. You can also use something to stir up the coals and get some of the ash to fall through that way. Once you have the ash cleared out of the coal pan and into the base unit dump the ash out of the base and put the coal pan back in. The ash will contain hot sparks and needs to be put someplace where it can't cause a fire. Do not put it in the trash for a minimum of 24 hours to ensure that any embers have died. Now you can add more coals to the pan. The coals you add to the pan need to be burning and ready to go. A charcoal chimney works great here. With the fire restored you can put the barrel section back in place and resume smoking. Don't trust the thermometer built into the lid. I've used a couple of these smokers and each one reads differently at the same temperature. You want to reach a good temperature of about 225 F (110 C). An oven thermometer is more accurate. If the temperature gets too high, thrown some wet wood chips on the fire. This will lower the temperature a little and build up some smoke. If the temperature gets too low, open the little door on the front of the smoker to let additional air in to build up the fire.